From Goodreads: Being fourteen is a minefield: with fashion dilemmas, teacher trauma, embarrassing parents and boy drama, Faith is just hoping to make it through Year Ten without too many disasters. 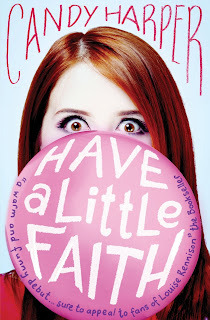 But when she and her best friend Megs sign up to take part in an inter-school choir with the local boys comprehensive, Faith's life gets even more complicated… just how is she supposed to concentrate on becoming the next Cheryl Cole when she's trying to understand how teenage boys' minds work? OMG! How much did I love Faith!!! She is so awesome and the whole book was an absolute joy to read. Faith is a bit quirky, but boy is she funny! I had so many laugh out loud moments I was getting really strange looks. She is constantly getting herself into trouble and the things she says sometimes! Her voice is definitely what makes this book! I was really disappointed when I got to the end - I wanted more! However, it is a good place to leave things until the sequel which is due next year. I just wish I could read it now! I can't wait to find out what Faith gets up to next. Perfect for fans of Louise Rennison, Sue Limb and Karen Saunders! This is one of my favourite books of the year so far. LOVE. It's nice to have something like Georgia Nicolson around again! Sophie - It's fab isn't it! I I can't wait for the next one! Such a cute sounding book-love the comparison to Louise Rennison's stories and how important friendship seems to be in this book since you mention Megs as a good friend for Faith.